Sorry about the big gap above - blogger is always causing problems. In Maggie Stiefvater's Shiver, Grace and Sam found each other. Now, in Linger, they must fight to be together. For Grace, this means defying her parents and keeping a very dangerous secret about her own well-being. For Sam, this means grappling with his werewolf past . . . and figuring out a way to survive into the future. Add into the mix a new wolf named Cole, whose own past has the potential to destroy the whole pack. And Isabelle, who already lost her brother to the wolves . . . and is nonetheless drawn to Cole. At turns harrowing and euphoric, Linger is a spellbinding love story that explores both sides of love - the light and the dark, the warm and the cold - in a way you will never forget. 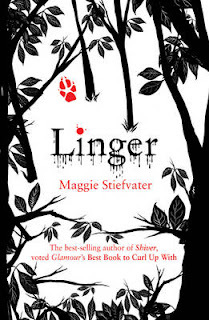 I thoroughly enjoyed Linger. As usual it didn’t lack stiefvater’s usual use of amazing detail that makes it so life like and realistic. I liked how in this book it went into the science side of the werewolf as it refines the book more making it much easier to understand how the werewolf works. The series are very good and do work as standalone books, which is something I like because I have read the series and do read them in order but it means someone else doesn’t have to. Someone else could come along and read anyone of the series first. In linger the roles have swapped. Sam is now human and grace is now fighting with her inner wolf, which is nice because it is always the boy who is mysterious and the mythical creature so for once the tables have turned. In the book Cole is introduced, and so far he seems fine but only when grace is around, so I think even though there is meant to be something between him and Isabel, in forever he will fall in love with grace and there will be this love triangle ting. The other thing that was good was that Isabel’s point of view was included, sharing hoe she felt abrupt everything, because as we know she has a very unique personality. I HATE GRACE’S PARENTS. Everyone I know who has read the book has the same thoughts. They’re like, oh Sam is bad for our little Gracey Wacey – Grace you grounded he’s bad for you – and they’re are really snobby and stuck up to Sam who actually loves Grace more than they ever will. I mean at the end, Grace’s mum is a bit better but her Dad just gets worse. Punch Sam! How dare he.